Nanacoco isn't a company often talked about, but I've been super impressed with the polishes I own. I think part of the problem is that unless you have a local nail supply store that stocks them, then you have to order them online. I'm lucky enough to have them at an affordable price nearby. Tonight I have 2 colors from the Cyrstal HD collection that feature metallic foil finishes. Up first is Neon Flux which upon first glance looks silver, but is actually a really subtle green foil. The second color called Star Dance and is a reddish orange metallic foil that is perfect for fall. The polishes pretty much applied themselves in only 2 coats. I also want to mention that you get an extra 1 mL with these polishes (you get 16 instead of the normal 15 mL)-so much polish! Like I said before, finding these polishes is the hard part. I found these on Amazon for $5 each or HB Beauty Bar for $3-$3.50 (I'm not sure if you have to have a license to order from them...if you know, please let me know). TGIF! I actually received 2 colors from the Boho Chic collection, but 1 broke in transit *cue sad violin music. * Tonight I have a color called Fish-Teal Braid (fun name!) which is a bright teal blue creme. It wasn't until I was about to take this polish off that I was wondering if I'd get some staining, and I did. It was more the cuticles and the skin on the sides of my nails that stained than my nails themselves. Just a little soap and a nail brush and my nails were as good as new. If/when I wear this one again, I'd probably wear a peel-off basecoat so I don't have to deal with staining. If you're into bright, festival-ready colors, the other polishes in the Boho Chic collection are for you. Want to Know How to Get Rid of Your Bad Mentality Nail Polish Safely? I hate ads. I especially hate ads on my phone or iPad. I bet that you hate ads, too! No, I don't want to have to click a tiny X in the corner of my screen. And don't get me started on when I accidentally click on the ad. I do understand that people want to make money for the hard work they do on their blog. I mean, I'm a blogger, of course I would like to at least come out even (ad revenue vs polish/supplies spent), but I have never done so. Ever. This is fine because I choose to have this blog, and I'm not crying about not making money off of it. That being said, as a blog viewer, I hate ads. I have now decided to use a service called Patreon that will allow you to directly support my blog through pledging monthly donations to my site. Here is a link to my Patreon page (which will also be posted on the top right hand corner of the blog). This means I can have better content, more giveaways, etc. This is not a new idea, and maybe a blog you already read has Patreon. You can pledge as little as $1 month and you can stop at any time. I don't expect anything from any of you, but I just don't want to have ads anymore. You guys have been great through the many years I have been blogging, and I appreciate all of your kind words and support. Oh yeah, and I also hope to have a more streamlined layout on my blog soon, so stay tuned. It's no secret that I'm a fan of Sally Hansen. They have consistent quality and are relatively easy to find in the US (unless it's a limited edition color-I'm looking at you, Opulent Cloud from a few years ago...anyone else remember that craziness?). Two new collections have been released this fall with the introduction of their new 2X Volume Gel Top Coat (more on that later). Tonight I have 2 colors from the 7-piece Tribal Vibe collection to show you. Up first is Per-Suede which is a leathery red/brown creme. I know, it's a weird description, but surprisingly fitting. It has that Tuscan feel that reminds me of a terracotta pot. This is a great fall color that has really warm undertones. I have been vocal in my dislike for the Sally Hansen tapered brush, but I think I finally got used to it. It's still not my favorite, but I know it's loved by many. This also had such a great formula and application. The second color is called Terra-Coppa and is a metallic copper and silver shimmer. They recommend using 2 coats of the color (no base) with 1 coat of top coat and I was worried that I would need a third coat of color for this one. I ended up just using 2 coats, but you may need a third. This is another great fall color and I may need to buy the rest of the collection if I find it at a drugstore. Despite it being a little more sheer, the application was perfect. I used the new 2X Volume Gel Top Coat for all of the swatches. I know some people have had some issues with the old top coat streaking the color, so I was curious to see if this was corrected with the new formulation. Well, yes and no. I did have 1 nail that slightly streaked (middle finger on Per-Suede), but it wasn't noticeable unless you looked straight at my nails. I really don't know what causes this, do you? In terms of the volume, I don't really think about volume unless I'm talking about mascara, am I right? I think it's slightly thicker which might remind you of a true gel polish application. Is it completely different than the 1st formula? No, but I still like it. I ended up wearing Per-Suede to DC a couple weeks ago and had no chipping of peeling with about 4 days of wear. The only thing I noticed was that the gloss of the top coat slightly dulled which isn't surprising. If you made it this far in the review, congratulations! Apparently I was feeling a bit long-winded today. These will run you about $10 from drugstores, but make sure to look out for sales. You can find more about Sally Hansen on their Twitter, Facebook, and Instagram pages. Hi guys, Happy Monday! I feel like I went a little overboard with buying polishes from Scofflaw Nail Varnish, but there was a sale (the biggest of the year from them, I believe) and I wanted to make shipping costs worth it. At least that's what I tell my wallet and my husband. Tonight I have the final 2 polishes I bought. First I have a polish full of glitter called Maxwell Demon which is a peachy/pink crelly with purple, blue, and purple hexagonal glitter in different sizes. Is it just me or does this look like a berry patch? It's a busy polish, but in a good way. The creme/jelly base was fairly sheer, so I needed 3 coats for full coverage. Make sure you use thin coats because it can get thick otherwise. The next color is hands-down my favorite of the bunch. I wasn't expecting to love Wraith Pinned to the Mist as much as I did. It's an aqua blue polish with lots of fine purple, green, and blue shimmer and gold flakes. The flakes stand out more than the shimmers, but it just adds to the depth to the color. This was also a bit sheer, but there were no application or formula issues at all. Please get this one, you won't regret it! Scofflaw Nail Varnish colors retail for $9 on their website. Sign up for the newsletter to find out about restocks and new collections. You can also find out more about them on Instagram and Facebook. If you have any questions or comments, I'm sure they'd be happy if you stopped by. Let's go ahead and continue to look at a wonderful indie brand that I 100% support. We can continue to discuss Mentality Nail Polish (and how they decided to put their neon collections on sale for 50% off..despite not continuing to offer refunds or replacements on polishes that may be affected by the bad base...don't get me started) but none of this drama comes with Scofflaw Nail Varnish. Tonight I have a polish that is an unusual love for me. Great Odin's raven, David Bowie's Bulge is beautiful (I never thought I'd say that sentence)! It's a bright coral color with multiple sizes of teal glitter and a sprinkling of subtle gold shimmer. You guys know that red colors are not a favorite, but the mix of the 2 colors just called to me. I was also impressed with the application and formula because it required no dabbing and you could just use normal strokes with it. So, in case you aren't in the loop (and I wasn't until earlier today), there have been some issues with people experiencing tingling, burning, or even nail lifting after using polish from Mentality Nail Polish. If you want to learn more, there is some great information from Manicured & Marvelous and Betty's Beauty Bombs. Please read those before reading what I have to say about the issues. Ok, I can totally understand how this is a huge problem for a small business like Mentality. And no, it's not their fault that the suspension supplier they were using from April-June of 2015 had some sort of formula issue that can cause a sensitivity to some. If you bought polish from them during this time, please e-mail Mentality ASAP for replacements (they have a new supplier for the base). So you may be wondering why the heck I am throwing my 2 cents out there for everyone to see. Well, I bought some Mentality polishes last month during their sale. I have never ordered from them previously so I should be fine, right? Right. Being a blogger you'd think that I knew something about this going on. Well, you'd be wrong unfortunately. I follow so many brands and people on Facebook and Instagram that about 95% of what is on my feed get lost in the shuffle. I never heard any of this until today. I think this is a problem because how many bottles are out there that could cause health issues? What percentage of people get reactions? To sum up, I've had a sensitivity before, but it was not because of Mentality Nail Polish. Do I think they handled the incident well? No. Will I try out the polishes I bought last month? Yes, because I trust that they changed their supplier. Will I be buying more from them? No, at least not in the near future because the ones I bought didn't blow me away, not because of what happened. Will this stop me from buying indie brands? Of course not! Some of my favorite brands are indie companies due to their wonderful CS and unique products. Based on further developments from how Mentality Nail polish has been dealing with this issue, I will not be ordering from them again. Ever. I recommend you read what they have to say about refunds and replacements on their Facebook page. To paraphrase, they will not be giving any more out. I am not amused by their tone, and it doesn't seem like they are taking things seriously enough. Apparently people have had to seek medical attention, so they are lucky nobody has sued yet. I am still sticking by my other favorite indie nail brands, and I hope their business is not affected by how Mentality has chosen to deal with the situation. One of my favorite blogs, The Mercurial Magpie, who swatches for tons of indie brands, has information about how Mentality filed to be a corporation after all of this went down (but before it really blew up the last couple days). Questionable at best. Hump Day! This week has been flying by, and that's totally ok with me. Tonight I'm featuring an indie brand that is new to the blog called Scofflaw Nail Varnish. They were an immediate success back in 2013 and are still not the easiest to buy (I bought these this summer and the colors sold out fast). The polishes retail for $9.00. Up first is Flotsam & Jetsam (I'm in love with the name!) which is a mint green color with turquoise and purple microglitter and flake shards. I think it was the flake shards that really drew me in. It's a busy color, but that just makes me love it even more. I found the base to be a little sheer, but it fully covered in 3 coats. I was expecting it to have a really thick application, but I need to quit going into trying new indie's thinking that way because 99% of the time they are amazing. The second color is actually part of a duo that sold out within minutes (I was lucky to get one of them) called Love Letter to Bob Ross. If you don't know who Bob Ross was, what rock have you been living under? I was a huge fan of Bob on PBS during the 80s. His voice was just so soothing! And the happy trees! Love Letter to Bob Ross has a lot of subtle things going on with it. It's a really deep blue green teal color with grey flakes and red, pink and blue shimmer. Even though it's really dark, it never appeared black in any light. I think this is the perfect fall or winter color. It had a smooth application and was almost a 1-coater. Scofflaw Nail Varnish colors retail for $9 on their website. Sign up for the newsletter to find out about restocks and new collections. You can also find out more about them on Instagram and Facebook. Just a quick reminder that the Rescue Beauty Lounge nail polish is 50% until 11 PM tonight (these retail for $20 so this is the only time I can afford to get a couple...cuz das expensive). Also, I don't believe I mentioned that there will be some CoverGirl Star Wars polishes coming later this year. Any thoughts? I'm not the biggest fan of CoverGirl polishes, but I'll be interested in seeing some swatches. Tonight I have another color from the summer China Glaze collection called UV Meant to Be. It's a lovely, bright robin's egg blue creme that would also make a cute pedicure. It's bright, but not neon like most of the collection. I think this may have been the reason why the polish applied really well and was fully opaque in 2 coats. I'm back from DC! I was so exhausted last night that I didn't have a chance to blog. Sorry! So many pens and so little time. I feel like I took a million pictures, but none with my phone. I do have a haul photo on my Instagram and Twitter. 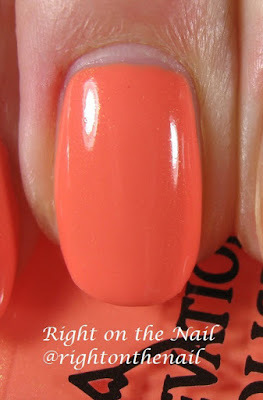 I'm back today with a couple more polishes from the SinfulColors summer line. Otaku Anime is a sheer yellow shimmer that will either need 4 coats over no polish or 2 coats over a white or yellow polish. I used a yellow creme as underwear, but if you don't mind VNL or have short nails, you may use it alone. The formula was a bit thin, so be careful of pooling, Despite it being sheer, I think it's a perfect bright yellow. The second polish I have is called Paste-erd which is a glitter topcoat with black and light blue hexagonal glitter and a sprinkling of black bar glitter in a clear base. Some are not a fan of bar glitter, but I tend to like it and it's not the focal point. I used it over a bright white, but I could see this over lots of different colors. It was fairly glitter dense and I didn't even get any bubbling at all. You can find this collection now at your local Walgreens, Rite Aid and other mass retailers for only $1.99. Make sure to look for sales that only make them $0.99. Also check out SinfulColors on Twitter, Instagram and Facebook. Hi guys! I will be heading out to DC in a little bit, but before I go I wanted to show my final Elevation Polish with you. It's called Epidote 2 (apparently Epidote 1 was less holo and was more gold or yellow) and it's a mossy green linear holographic polish. Oh I love it! It would make a perfect fall manicure for sure. It also had a perfect application and formula in just 2 coats. I usually use thicker coats, so a third coat may be needed for some of you. Somehow this is only $8.50 (and available now) which is pretty great for an indie holographic polish that can cost around $14 at other stores. What do you think? I will be on Instagram/Twitter this weekend posting some pictures from the DC Pen Show, so if you don't already follow me, feel free to do so....I'm @rightonthenail. A new collection was released from Elevation Polish last week and features polishes inspired by the Netflix show Marco Polo. You can find out more about Elevation Polish from their website, Facebook, and Instagram pages. Hi guys! I hope your week has been going well so far. I will be going to DC this weekend for the largest pen show is the US. Yup, they exist, and this is my third year going. I've also gotten back into knitting. I was so into it a few years ago, and then I just quit. I really didn't have a reason to do so, but it happens. Any knitters out there? I enjoy the knit stitch more than the purl stitch. Tonight I have 2 more swatches from the Elevation Polish Woke Up in China collection. The first is Yungang Grottoes which is a gorgeous coral pink color with gold shimmer. If you can't see the shimmer, you may need to click on the pictures. It is a bit hidden in swatches, but it is more noticeable in person. Does this not remind you of a sunset? I went on an indie buying spree last month, and this may be my favorite polish. The formula was slightly thin and was streaky on the first coat, but it full covered with the second (and it self-leveled). If you use really thin coats a third layer may be needed. I talked about Yeti the Stone Warrior on Monday, so I'll just let you admire how it looks over Yungang Grottoes. I think it looks just as good tonight as it did on Mount Wutai.